The dictionary’s definition of chocoholic is “someones who craves chocolate.” That’s simple enough and pretty much applies to me and most of the people I know. Probably most of the people *you* know. 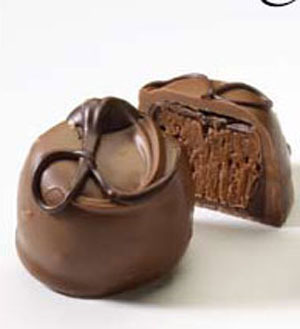 Chocolate is one of the most popular food products in the world. And at this time of year, with it all around us to be part of the holiday enjoyment as well as gifts to be given to friends, we just think more about it. Chocolate is made from the partial fermentation of beans from cacao trees. The trees are small evergreens that originated in the Amazon basin. They have to grow near the equator because they need a great deal of rainfall and can’t survive temperatures below about 60 degrees. Nowadays, more than three-fourths of the world’s trees are grown in Africa. The trees were cultivated in Mexico, Central and South America more than a thousand years BC. The Aztecs brewed a bitter drink from thebeans and chili peppers, which was favored by their kings and used as an offering to their gods. 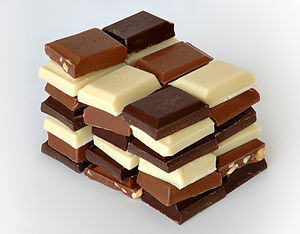 Chocolate found its way to Europe after the Aztecs introduced it to the Spaniards. Hard, durable chocolate didn’t come into existence until the early 1800s when a Dutchman patened a process whereby cocoa butter could be removed from the chocolate. Now, cocoa butter is added back in varying amounts. More recently, research has revealed potential health benefits from eating chocolate. Limited amounts of dark chocolate appear to help heart disease in that ingredients in dark chocolate appear to inhibit oxidation of LDL cholesterol and might even lower blood pressure in some people. So! We just drew names at my job for our Christmas gift exchange. The person whose name I drew is someone I like a lot, so I was thinking and thinking about what I could give her. Then I hit upon the perfect thing. Gourmet chocolates. Come on, everyone. Indulge yourselves. Make some fudge. Eat a box of truffles. It’s Christmas!